As I spent Saturday preparing a sermon for Palm Sunday and watching thousands of young people clamoring for change at the March for Our Lives rally in Washington, D.C., I was greatly inspired. Hundreds of thousands of protesters, outraged by the recent mass shooting at Marjory Stoneman Douglas High School in Parkland, FL, took to the streets in Washington, D.C. demanding political action against gun violence. Hundreds of thousands more attended the more than 800 other protests taking place in every American state and on every continent except for Antarctica. 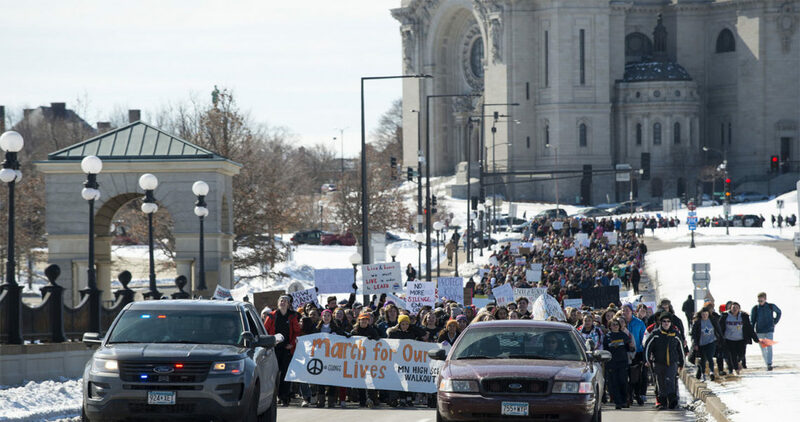 While I don’t know if the organizers of the March for Our Lives intentionally planned for the march to take place on Palm Sunday weekend, witnessing hundreds of thousands of people marching to our nation’s capital provided an excellent backdrop for reflecting upon Jesus’ march into Jerusalem. Many people argue that the church is not a place for politics. I argue, however, that Jesus never separated religion and politics. To the contrary, Jesus used religion to challenge politics—to speak truth to power. Jesus was executed because he dared to use religion to challenge politics. Jesus’ execution—a Roman crucifixion—was a political execution. Crucifixion was a form of execution often imposed upon those considered to be a political threat to the Roman empire. Similar to how hundreds of thousands of people marched into the nation’s capital demanding change, Jesus and his followers marched into the capital city of Jerusalem over two thousand years ago demanding change—demanding the liberation of thousands of poor people suffering under political and religious oppression from the Roman empire. As a follower of Jesus, I am acutely aware of the painful paradox represented by the fact that it was and continues to be thousands (if not millions) of self-proclaimed evangelical Christians who supported the election of our nation’s current president and who have historically resisted attempts to pass any sort of commonsense gun control legislation (although the tide is now shifting). In other words, I am aware that Christians are complicit in the political mess in which we find ourselves and against which hundreds of thousands of people (primarily young people) are now protesting. Because of this Christian complicity, I feel compelled to remind Christians that Palm Sunday is fundamentally about a choice—a political and theological choice. According to Christian tradition, on the day we now call “Palm Sunday” Jesus entered the capital city of Jerusalem on a donkey through the east gate of the city while the Roman governor rode in on a horse with his soldiers through the west gate. The action represented a way of offering two choices for a king and a kingdom and asking, which one will you choose—the kingdom of Rome or the kingdom of God. Jesus came preaching the kingdom of God over the kingdom of Rome. The confession of the earliest followers of Jesus was, “Jesus is Lord,” meaning Caesar was not “Lord,” nor was any other imperial ruler. I believe people and communities that claim to be followers of Jesus have to ask, “what does the confession, ‘Jesus is Lord’ mean today. As followers of Jesus, do Christians choose the kingdom of God or the kingdom of Rome? Do they choose to follow Jesus entering the east gate or an imperial leader entering the west gate? Is Jesus Lord or is Caesar Lord? What happens when we genuinely contrast the teachings of Jesus with what I consider to be the amoral values of our present imperial leaders? Who will we choose to follow? What choices will we make, and HOW will we demonstrate those choices? Several years ago, I became a supporter of Sojourners. Sojourners’ ministries grew out of the Sojourners Community, located in Southern Columbia Heights, an inner-city neighborhood in Washington, D.C. The community began at Trinity Evangelical Divinity School in Deerfield, Illinois, in the early 1970s when a handful of students began meeting to discuss the relationship between their faith and political issues, particularly the Vietnam War. It’s amazing how many social movements start with students. Recently, a number of the leaders from Sojourners composed a declaration to be shared with churches across the nation. One of the guiding principles behind the declaration is the conviction that what we believe serves as the foundation for the things we must actively reject. The question we face is this: ‘Who is Jesus Christ for us today? What does our loyalty to Christ, as disciples, require at this moment in our history?…’ What we believe leads us to what we must reject. Our ‘Yes’ is the foundation for our ‘No.’ What we confess as our faith leads to what we confront. As I watched and listened to young people demanding politicians to value and protect the lives of young people as much as they protect the right of virtually any American to buy and own military assault weapons, I wondered, “who is Jesus” for the countless Christians who reject common sense gun laws. What are the Christian beliefs that serve as the foundation of their rejection of common sense gun laws? All across our nation and across the world, people are clamoring for change. People are clamoring for justice and fairness. Various kinds of oppression are plaguing our planet. After celebrating Palm Sunday and now reflecting upon the life and ministry of Jesus during what is commonly referred to as “Holy Week,” Christians have a choice to make, do they follow the ways and teachings of Jesus who entered the capital city through the east gate proclaiming “my house shall be called a house of prayer for ALL people,” or do they follow the ways and teachings of imperial leaders who are concerned primarily with the well-being of the political and economic elite of the world. I pray during this Holy Week that Christians choose to follow the ways and teachings of Jesus rather than the ways and teachings of imperial rulers.